Get Red Cross training in Maryland that suits your needs and your learning style. With a wide range of classes for students of every age, we can help you prepare for emergencies, learn new skills, and become part of a community that's not only willing, but equipped, to help in times of need. Explore the types of Maryland Red Cross classes available, and find new ways to make a difference. When you enroll in one of our CPR classes in Maryland, you'll not only receive world-class training from the American Red Cross, but you'll also gain access to a wide range of digital learning and refresher materials. From interactive simulations to tip sheets and quizzes, our innovative training materials can help you learn how to perform CPR and keep your skills fresh. When you choose in-person CPR classes in Maryland from the American Red Cross, you'll join others from across the area for training from experienced, licensed professionals. Part lecture, part hands-on skills session, our in-person classes give you plenty of time to ask questions and become comfortable with the processes and procedures involved when providing care. The Red Cross offers Maryland BLS classes that are taught by local professionals who are experts in the field. By delivering content in a traditional classroom setting, we're able to ensure that you'll have plenty of time to ask questions, explore topics as a group, and get the hands-on skills training you need to help improve your patients' outcomes. 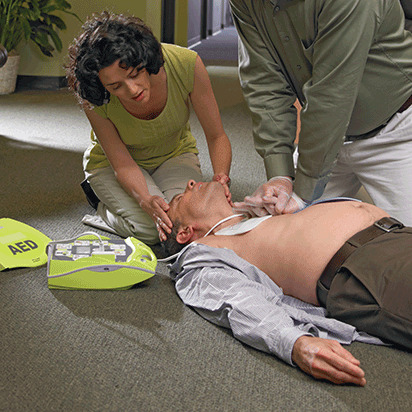 Basic life support, or BLS, classes in Maryland focus on the skills needed for first-responders, healthcare providers and public safety professionals to provide care to anyone who is experiencing cardiac arrest, respiratory distress or an obstructed airway. Throughout your training, our expert instructors will help you gain knowledge and skills in cardiopulmonary resuscitation (CPR), using automated external defibrillators (AED), relieving airway obstructions in patients of every age, and more. Maryland AED training from the American Red Cross can be found in cities across the state. With dozens of classes available every year, finding one that's not only nearby, but also works with your schedule is simple. Browse our newest course schedule to find the AED classes, and gain the skills you need to help when it's needed most. In-person Maryland AED certification classes from the American Red Cross are taught by experienced professionals who can help you understand how and why to use an automated external defibrillator. Throughout the lecture portion of the class you'll learn "theory," and have ample opportunity to ask questions. During the skills session, you'll learn how to use AED devices properly and will receive personalized instruction to ensure that you understand all of the procedures. At the Red Cross, our Maryland lifeguard certification courses can help you achieve your goal of becoming a lifeguard. Training choices include in-person classes, as well as our blended Simulation Learning, which combines online coursework with in-person skills sessions. Regardless of which type of lifeguard training you choose, all students must be at least 15 years old by the last day of class, and pass a pre-course swimming skills test. The Red Cross offers lifeguard management training in Maryland that can help you learn to effectively manage a team of lifeguards, and keep your guests, staff and facilities safe. This interactive online-only course takes just a few short hours to complete, but can give you the training you need to meet your goals. Once you've successfully completed the lifeguard management class and the final exam, you'll receive a 2-year certification. Embark on a rewarding, meaningful career. Take CNA classes in Maryland from the experts at the American Red Cross. With in-class and hands-on experience, our program can help you gain the skills needed to provide care in a range of settings – and can help prepare you for the Maryland CNA certification exam. Certified nurse assistant (CNA) training can help you become a vital member of a medical team that provides care to patients in a wide range of settings. As a CNA, you may record vital signs, assist with bathing, grooming and feeding patients, help nurses with medical equipment, and more. Find out how to begin your CNA training in Maryland with the American Red Cross – and start your career in the medical field. The Red Cross offers babysitting classes in Maryland that can help you more safely and effectively care for the kids in your neighborhood. Through the use of interactive modules, real-world scenarios and lecture/coursework, our classes will help you learn how to provide care for infants and children, administer basic first aid, help children behave, choose age-appropriate activities, gain leadership skills, build your business, and more. The Red Cross offers online and in-person Babysitter training in Maryland making it easy to find a class that suits your schedule, your needs, and your learning style. Developed by experts in the field, our Babysitter certification courses deliver the latest information to help you become a capable, confident, and trusted babysitter that parents will turn to again and again. In Maryland, first aid certification classes from the American Red Cross are available online, in person, or via our blended Simulation Learning experience, which combines online coursework with an in-person skills session. Designed to help you understand how to provide care during times of crisis, the course covers how to control external bleeding, provide care for burns, deliver care during and after seizures, and more. Note: Online-only first aid classes do not result in full, OSHA-compliant certification. In Maryland, first aid certification classes from the American Red Cross are delivered in a variety of ways. For full certification that's also OSHA-compliant, it's important to enroll in our in-person or blended Simulation Learning courses, which allow you to demonstrate your skills to a trained instructor. For individuals who don't need an OSHA-compliant certification, we offer online courses that allow you to learn at your own pace and practice your skills via our interactive coursework.